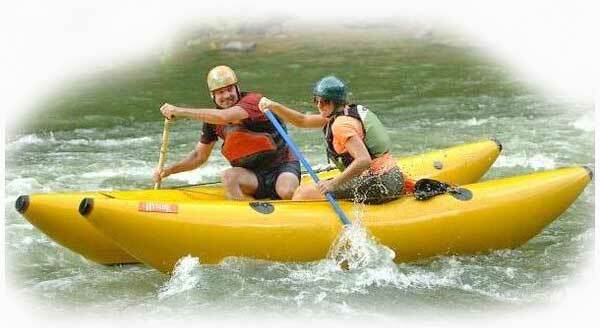 of high quality professional grade rafts, Hyside Paddle Cats, inflatable kayaks, paddles, oars, life jackets (PFD's), pumps and safety equipment. 2018 SUMMER SPECIAL!!! FREE SHIPPING & LOWER CAT PRICE! Get your Paddle Cat in Yellow, Green or Blue for only $2275. normally $2295. plus FREE SHIPPING anywhere in the domestic US. 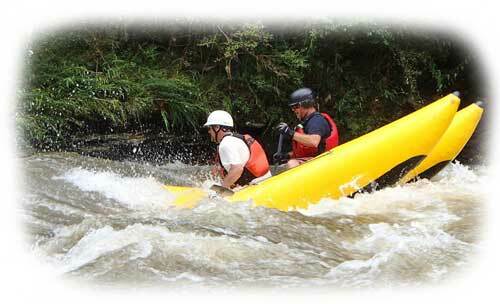 Traveling down-river in a Hyside Paddle Cat is about the most fun one or two paddlers can have on the water! It's constructed of ultra durable Hypalon with a urethane coating on the bottom of the main tubes that not only protects the bottom but is also very slick. It's made of two pontoons with two connecting thwarts and a floor with two mounted foot cups. It is paddled primarily tandem with one paddler on each tube though it can be R 1 if desired. The seating is very comfortable due to its large tubes and foot cup placement. Cats stay cooler when you sit down on a tube in direct sunlight due to their blue, green or yellow color. Incredibly stable and maneuverable, these lightweight Cats (just 46 pounds) are suitable for Class III-V runs, can be easily backpacked to the put-in or portaged around unrunnable rapids and are ideal for first descents. They are also easy to carry back up to run the rapid again! The Hyside Paddle Cat is a craft that allows a less experienced paddler to do more difficult runs as it is very forgiving. It makes most Class III runs seem easy and you will soon be surfing your favorite surf holes or waves. The Cat is easier by far than paddling a small raft and handles much better than a raft. It's great for those who might have kayaked a lot and now have shoulder issues or just want to get on the river with a friend or spouse. It's a real confidence booster and totally suitable for Class IV and V runs once your skill level is up to it. Hyside Paddle Cats are a great rescue craft! They are easy to get in and out of and track very well once you get your angle set. They are superb for rescuing kayakers and rafters having an out-of-boat experience or running unwrap lines to a wrapped boat. Each Cat has a 3 year warranty and comes with a carry bag, repair kit and valve tool. I've been whitewater kayaking for years, the river feeds my soul! I've always wanted to try a cat, and found the affordable Hyside Paddlecat. I boat anything from moving water to class V and the paddle cat has not disappointed! My first paddle with the paddle cat was down the middle section of the Moose River in the Adirondacks, where I live - this nice class II-III stretch was beautiful in the sunset and so much fun. I then paddled the class III-IV Lower section of the Moose with my brother - who qualified to paddle because he once went down the Black river in a raft. He did great and we had a fantastic time! I had an experienced boater friend go down the class IV drops with me and the paddle cat went over the holes like nothing! So much fun! Stepped it up a notch and took it down the class IV-V Bottom section of the Moose with my best friend and paddling partner - we walked the class V drop at the start, because of a dangerous hole at the bottom, then styled all the rest of the drops. It was great! Took it down the Independence River at flood stage, bombing through huge waves and holes next - big challenge and the paddle cat was stellar! Then, that night took another sunset paddle with my partner again down a class II-III stretch of the Black river, just beautiful and a paddle I'll always remember. My partner was feeling so good after this paddle, he said it was a totally different way to see the rivers - not like a kayak, not like a raft but something new - he loved it too! Thanks, Top River Gear, for this new way to experience my favorite rivers! Recommended Accessories for your Top River Gear Cat. Save 10% if you order any of these items with your Cat order! Recommended paddle size is 5 feet. Rowing Frames will work with Paddle Cats for longer trips or if just you like to row instead of paddle or R 1. See photos and building instructions submitted by Scott V. on this site. Flip lines are a good idea for righting your Cat and one will do it but I always carry two in a waist pack to assist rafters who have flipped. I prefer waist throw bags rather than ones binered into the Cat as the less loose gear or things hanging down from your upside down Cat the better. Or put your throw bag in your day-use carry bag with your lunch, water, medical and repair kit, etc. All these items are manufactured by NRS (Northwest River Supplies) or by suppliers that sell only quality products that I have personally tested and use on my Cat! NRS #1980 Tear- Aid Patch Type A $9.95 I have never put a rip, tear or hole in a Cat yet but if I do this kit will get me get me back in most cases. NRS #1820 Bow Line Bag 25 Feet: $34.95. Keeps your bow line handy but out of the way. NRS # 1463 1-inch D-Ring blue or yellow. Specify. $9.95. A must-have item to add to your Cat to carry over night gear or to rig your day use bag so the drain holes are not covered. NRS #1458 D-Ring with carry handle: $14.95. Blue or Yellow. Specify.. Really handy for portages or carrying your Cat upstream to run a rapid again. Also good for attaching your flip line to or tying your Cat down on your vehicle. #1810 Orca Foot Cups: $18.95. Blue or yellow. Specify. I mount these in the back of my Cat so when I get in after an out-of-Cat experience and something big is looming just downstream I have foot cups handy no matter which way I am facing. Very useful if you plan on R 1-ing your Cat! #1720 K Pump 100: I use the K Pump 100 for topping off and to take on the river. Can be used to inflate your Cat if you hake into a put-in. $72.95 . #1726 Blast Inflator Pump: $119.95 Good for civilized put-ins with vehicles/batteries! Do not drive over it or slam the hood on it or drive off with it still under the hood! Need or want something from NRS that you want to save 10% on? 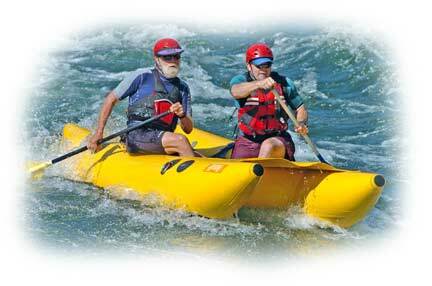 The 10% off only applies if you purchase a Paddle Cat, Raft or IK from Top River Gear. Let me know and I can add it to your order! It might delay the fast shipping of your Cat as I have to ship everything together in order for you to save the 10%. Will be worth it if you want some high ticket NRS items. Does not apply to paddle orders as they are quite expensive to ship by UPS in most cases. Better to purchase locally if at all possible. This video demonstrates the unique characteristics of the "Hyside Paddle Cat". 3 year factory warranty on materials, seams, etc. I bought a Hyside Paddle Cat from you last year and it is fantastic. I paddled around the original "Shedders" and I really thank this boat is much better. I do like the WEIGHT of the other boat but I would not trade it for all the other benifits. 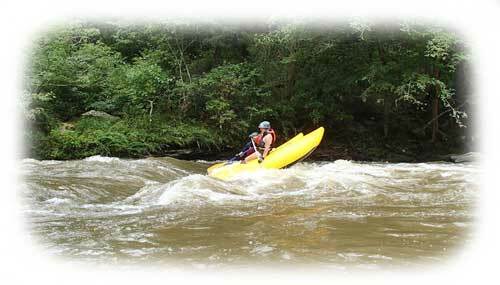 I play on the Ocoee and other rivers in North Carolina. I am taking it out on the Ark in a week. I do like the new improvements of slanted floor and more drainage holes. Over all great boat! This last winter ran some 4-5 water in Arkansas [Richaland Creek] and it handled GREAT. Each boat has some positive things so don't be critical of a great boat.